Gov. 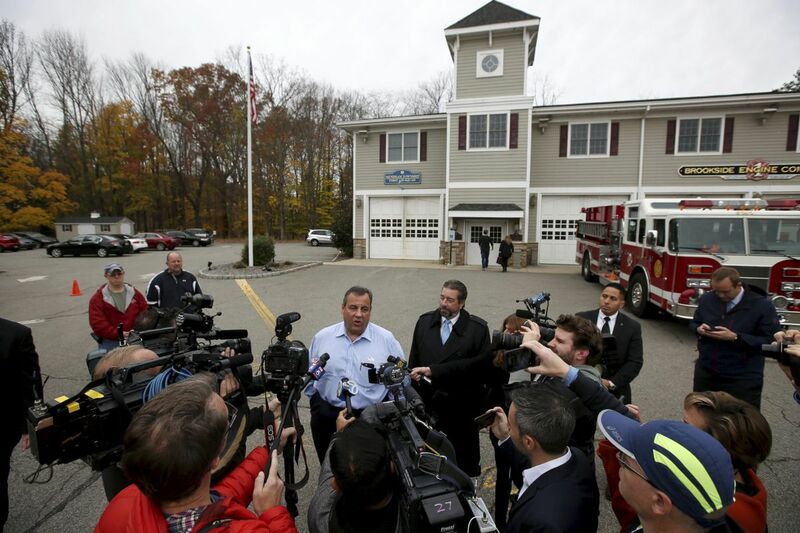 Christie speaks to reporters after voting Tuesday in his hometown of Mendham. Days after the vote, the governor nominated a replacement for longtime Gloucester County Prosecutor Sean Dalton — a move that surprised Dalton. Gov. Christie has appointed a new Gloucester County prosecutor — news that surprised the current prosecutor, who has held the position for a decade and a half. Sean Dalton, the county's longest-serving prosecutor, said he was caught off guard when he learned Thursday that he would not be reappointed. His term expired in 2012, but he said he had been serving for the last five years as a "holdover appointment." Christie named Williamstown lawyer Charles Fiore to replace Dalton. Both are Democrats. Gloucester County Prosecutor Sean Dalton was not reappointed by Gov. Christie, who nominated Williamstown lawyer Charles Fiore to the post. "After 15 years, I wish it could've been handled differently," Dalton said Friday as he reminisced on his time as prosecutor. His office, he said, has solved 95 percent of its homicides since he took over. A Glassboro native, Dalton had held the position since 2002. Before joining the Prosecutor's Office, he was elected in 1993 to the Assembly for the Fourth District and served for two years representing parts of Gloucester and Camden Counties. Under Dalton, the Prosecutor's Office launched a number of programs. Those include an initiative to increase the number of minority officers in the Prosecutor's Office and police departments across the county, with the number of minorities growing by 15 percent. Another initiative is a unit to fight cyber crime. "I'm very proud of the many accomplishments the office has made over the last 15 years," Dalton said. "We've established many public-private partnerships to improve public safety and reach out to the most vulnerable people in society." Despite a high rate of solved investigations and dedication to cold cases, the Prosecutor's Office under his leadership has not escaped criticism. In 2014, the family of murdered 12-year-old Autumn Pasquale sued the office, claiming authorities did not properly search for the Clayton girl after she was reported missing. A judge dismissed the suit in 2016. Attempts to reach Fiore were unsuccessful. According to a biography on Monroe Township's website, he has been municipal solicitor there since 1995, owns a law office in Williamstown, and graduated from George Mason University School of Law in Virginia. According to New Jersey Election Law Enforcement Commission reports, during the last 20 years Fiore has donated at least $17,000 to Democratic candidates in Gloucester and Cumberland Counties. His contributions include $400 to Dalton in 1997 when Dalton was serving in the Assembly and $500 to Democratic State Sen. Fred Madden in the Fourth District. After being nominated by the governor, Fiore must go before the Senate Judiciary Committee and be approved by the Senate. A spokesman for Christie declined to discuss the nomination "as a part of long-standing policy." The office of State Senate President Stephen Sweeney (D., Gloucester) also declined to comment. Christie nominated Woodbury lawyer William Ziegler to the New Jersey Superior Court’s 15th Vicinage. Democratic Gov.-elect Phil Murphy takes office Jan. 16. Nominated to a judgeship was William Ziegler, a Woodbury lawyer and Republican. Christie appointed the Mullica Hill resident to serve in Superior Court's 15th Vicinage, covering Cumberland, Gloucester and Salem Counties. Ziegler is a shareholder in the Woodbury law office of Holston, MacDonald, Uzdavinis, Ziegler, & Myles. He graduated from Rutgers-Camden School of Law in 1995 and has served as land use solicitor for several Gloucester County townships. Since 2009, Ziegler has donated at least $12,300 to local Republican candidates in Gloucester County and in Franklin Township, Somerset County, according to ELEC contribution reports. The nomination process began in June, he said, after Sweeney put his name into a pool of applicants. After a background check and interviews, Ziegler received a call from the governor's office on Thursday. He said his nomination would fill a seat recently left vacant by the departure of Eugene McCaffrey and would restore an even number of Republicans and Democrats on the bench. "I'm very grateful to the governor and the senator for this opportunity," Ziegler said.